Long ago legend says, when the country was still very young, the Vietnamese people had to fight against cruel and sturdy invaders coming from the North over the sea in many sailbarges. Pitying the people, The Jade Emperor sent the Mother Dragon and her children descending on earth to aid the ancient Vietnamese people in defending their beautifull, young country. While the mighty enemies were attacking the main land, The Mother Dragon and her children suddenly appeared and incinerated the enemies sailbarges with their divine fire and giant emeralds. The emeralds from the dragon’s mouth were scattered around the battlefield on the sea and formed an invincible defensive wall that left the enemy battleship fleet sinking. Thanks to the dragons, the Northern invaders were finally swept away, defeated and finally peace returned to the South East Asian country once again. After thousands of years, the wall of emerald turned into island and islets of different sizes and shapes. After the battle, The Mother Dragon and her children didn’t come back to the heaven, but stayed in the mortal world and turned into human form to help people planting, cropping, raising cattle, reclaiming, and expanding the country. 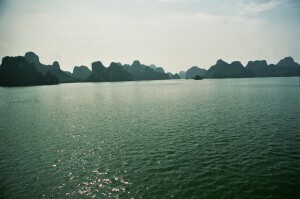 To remember the help of the Mother Dragon and her children, the people who live there, generation after generation have named the bay where the Mother Dragon descended “Ha Long or Halong”, which literally means “descending Dragon” and the bay where her children descended “Bai Tu Long”, which means “Thanks to the Dragon’s children”. This legend is also a cause of the general belief that Vietnamese people’s originated from Dragons. Vietnamese dragons (Vietnamese: rồng or long 龍) are symbolic creatures in the folklore and mythology of Vietnam. 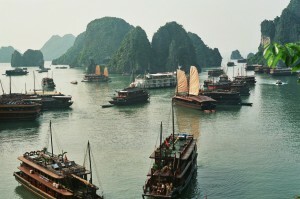 According to an ancient origin myth, the Vietnamese people are descended from a dragon and a fairy. 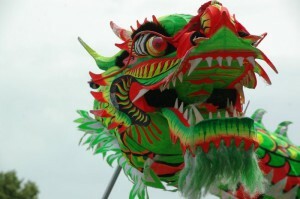 To Vietnamese people, the dragon brings rain, essential for agriculture. It represents the emperor, the prosperity and power of the nation. Like the Chinese dragon, the Vietnamese dragon is the symbol of yang, representing the universe, life, existence, and growth. 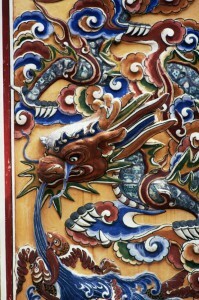 Extant references to the Vietnamese Dragon are rare now, due to the fierce changes in history that accompanied the sinicization of the Nguyễn Dynasty. The 5th-generation grandson of Shennong, Lạc Long Quân- king of the dragonkind living near the Đông sea, married a goddess, Âu Cơ who was the daughter of the birdkind king Đế Lai. Âu Cơ bore 100 eggs, which hatched into 100 sons. 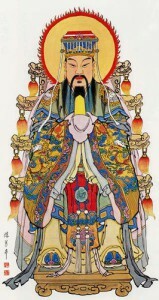 The first-born son became the king of Lạc Việt, the first dynasty of Vietnam, and proclaimed himself Emperor Hùng Vương. The First was followed by Hùng Vương The Second, Hùng Vương The Third and so on, through 18 reigns. This is the origin of the Vietnamese proverb: “Con Rồng, cháu Tiên” (“Children of Dragon, Grandchildren of Gods”). Ha Noi (Vietnamese: Hà Nội), the capital of Vietnam, was known in ancient times as Thăng Long (from Thăng, meaning “to grow, to develop, to rise, to fly, or to ascend” and Long, meaning “dragon”); the capital is still referred to by this name in literature. 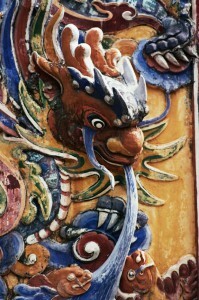 In 1010, King Lý Thái Tổ moved the capital from Hoa Lư to Đại La, which decision was explained in his Chiếu dời đô (Royal proclamation of moving capital): he saw a Rồng vàng (yellow dragon) fly around on the clear blue sky, so he changed the name of Đại La to Thăng Long, meaning “Vietnam’s bright and developed future”. Furthermore, one of Thăng Long Four Defense Deity (Vietnamese: Thăng Long Tứ Trấn) is Long Đỗ Deity (literally: dragon’s navel- where is the center, the place that Earth and Sky meet each other- according to orient’s view, the belly has a role which is as important as the heart is in western view). Long Đỗ Deity helped Lý Thái Tổ to build Thăng Long citadel. 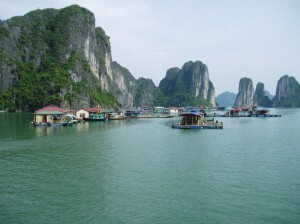 Many place-names in Vietnam incorporate the word Long, or Rồng (also meaning dragon): Hạ Long Bay (vịnh Hạ Long), the section of the Mekong river flowing through Vietnam contains 9 branches and is called Cửu Long (meaning nine dragons); Hàm Rồng Bridge, Long Biên Bridge. The city of Da Nang has a bridge shaped like a dragon, facing the sea. Other things named after dragons include: Thanh Long (dragonfruit), vòi rồng (waterspout), xương rồng (Cactaceae), long nhãn (dragon eyes: Vietnamese cognate word forlongan fruit).